This package is ideal for everyone who wants to get a taste of both worlds - wind and waves. Join for a great time on the island and work on your skills in an absolute tropical paradise. Throughout your week, you will have the chance to get to see the best Zanzibar has to offer - on and off the water. All Aquaholics staff will make sure you will have a great all-around experience surfing, kitesurfing, and enjoying the island to the fullest. During this camp, you will stay at the Ebb & Flow Apartments in Paje. The place is tucked away in a cozy courtyard-vibe property. It is just a few meters away from the beach and the kite center. Your room will have a hot water shower, mosquito net, fan, private balcony, and downstairs lounge with a simply equipped kitchenette to prepare snacks and store cold drinks. There is the option of booking a room with air-conditioning (optional) at a surcharge of 15 USD per night. Please let Aquaholics Zanzibar know at the time of booking, or you have the option to decide on the spot. Upon arrival at the airport, a driver will be waiting for you and take you on an approximately 1-hour drive to Paje, where you will be staying at the Ebb & Flow Apartments, just a stone's throw away from the pristine kite lagoons and the Kite & Surf Center. You will have a small meet and greet at the center after you settled in your accommodation, to get to know you and schedule your first lesson and activity for the week. You will have some time to relax on your first day and to explore the surrounding. If winds conditions are right, your lesson will start on your next day. If conditions seem better for surfing, you start off with the wave surfing. Kite lessons each day are around 2 to 3 hours, depending on the wind conditions. Your course will be finished after thee to five days. On two days, Aquaholics Zanzibar will take you out to the reef for some fun in the waves. Each surf trip is around 3.5 hours long and includes all transfers, gear, lessons as well as snacks and water. If the wind or waves do not allow all booked activities during your stay, they will be able to offer you lots of alternatives and swap activities around for same value. This kitesurf and wave surfing camp will take place in Paje, a small and vibey village on the Southeast Coast of Zanzibar. 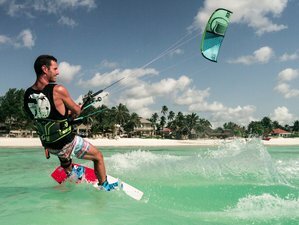 It is known to be the best kitesurfing spot on the island where you will meet a lot of like-minded travelers there. Wave surfing is not that well known yet on the island but Aquaholics have found amazing learner spots and will show you how fun uncrowded tropical island surfing can be. Supermarkets, bars, and restaurant are within walking distance of the location. Popular trips such as the Jozani Forest or a sunset trip to Michamvi are not far away and there are lots of other smaller tours in the surrounding area. You will be served daily breakfast which will be included at the neighboring Ocean Restaurant. Lunches and dinners are not included, but there is a great choice of bars and restaurants close by. Please book your flight to arrive at Abeid Amani Karume International Airport (ZNZ). Aquaholics Zanzibar's representative will pick you up at the airport. This service is already included in the price. The drive from the airport / harbor takes about one hour. You can take a ferry when flying into Dar es Salaam. Aquaholics Zanzibar's representative will pick you up at the harbor. This service is already included in the price. Airport: Abeid Amani Karume International Airport Airport transfer included: Abeid Amani Karume International Airport No additional charges. You can request this in the next step. Aquaholics Zanzibar is the first surf school in Paje. They offer surf trips and surf lessons on a daily basis.